Our four-part series has defined native advertising, discussed the ad blocking factor, and shared some best practices for serving native ads. You can say we’ve come full circle with this last piece; we’re delving into definitions, but this time with a focus on in-feed native ads. 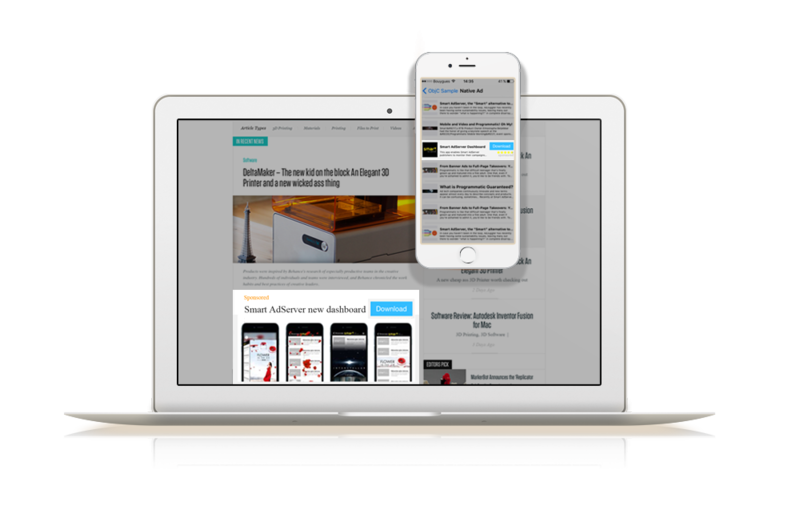 In-feed native advertisements are placed between the content on a page, allowing the reader to consult them naturally and with little effort. 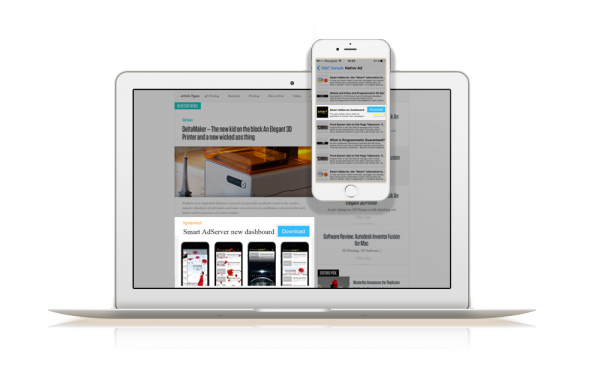 They’re often slipped in between content that appears on social media and news sites that use an “infinite scroll” feature, which has become especially popular on mobile and in-app. As we’ve seen, native comes in many colors. The IAB has defined the Core Six types of native advertisements: paid search, recommendation widgets, promoted listings, in-ad, custom and in-feed. With the purpose of aiding the industry in reaching a consensus on definitions and structure, a framework is used to define and assess each one. In-feed, however, has the widest variation in execution. In-feed native may seem all over the pace at first glance, but the IAB has done a good job of explaining how popular types fit into their framework, outlining the variations using its six-point framework, which focuses on what they consider to be the most important marketplace considerations: function, integration, buying and targeting, measurement and disclosure. As you’ll see by examining the examples below, in-feed advertisements can differ greatly in terms of function, integration and measurement practices. In-feed on sites like BuzzFeed, Gawker, Forbes BrandVoice, and Mashable fall into the first IAB category — in-stream ads that match the function of the site, mirror page content behavior and are narrowly targeted placements measured in terms of brand engagement. 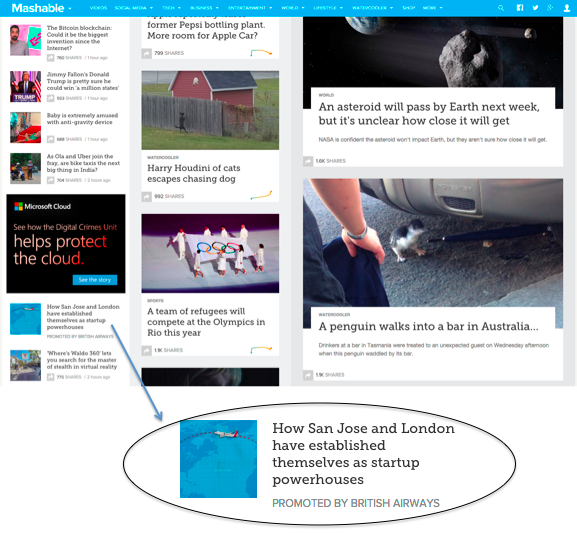 A good example is this British Airways in-feed ad that appears on Mashable. It’s clear that the ad fits in with the other articles in the stream; it matches the look and feel of the tech news website. However, when you look a bit closer, there are two visible differences between it and the other news articles in the feed. The first is the prominent disclosure line on the bottom (“Promoted by British Airways”), and the second is the fact that a user action — hovering over the article — is necessary to display the amount of times the article has been shared on social media. 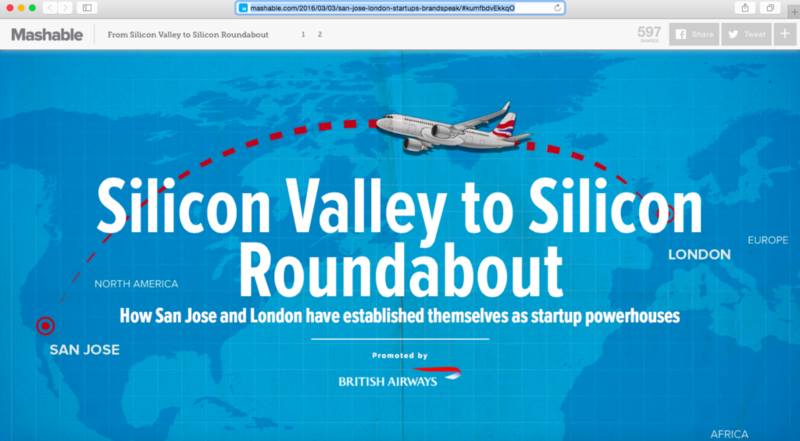 The ad links directly to a page within Mashable, like the other articles in the stream, but the British Airways-sponsored ad (although it highlights select San Jose and London start ups) reminds readers right away that that British Airlines will soon offer daily nonstop service between the two cities. No other advertisements appear on the page, and what follows is a full article. The second type of in-feed ad defined by the IAB is drastically different than the first. This example doesn’t match the function of the site, links to a page off the site, and is measured by click-through-rates rather than brand engagement. This type of ad manifests in the same way the Cartier LinkedIn ad below does. The publicity is slipped right into the user’s feed with a disclosure label, “Sponsoring”. 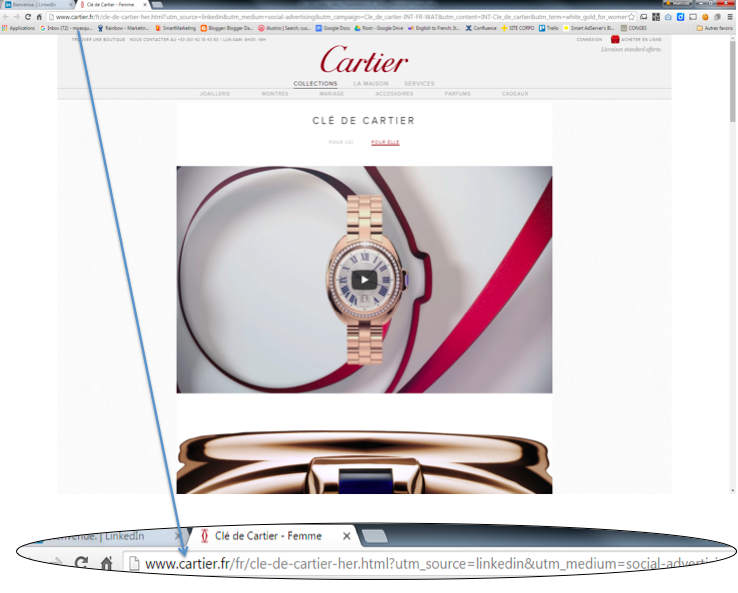 When the user clicks on the ad, they are taken to a page on the Cartier website. Examples of these kinds of ads can also be found on YouTube, Facebook, Twitter, Yahoo, Sharethrough and LinkedIn. As you can see, the Cartier ad and the British Airways ad are drastically different. 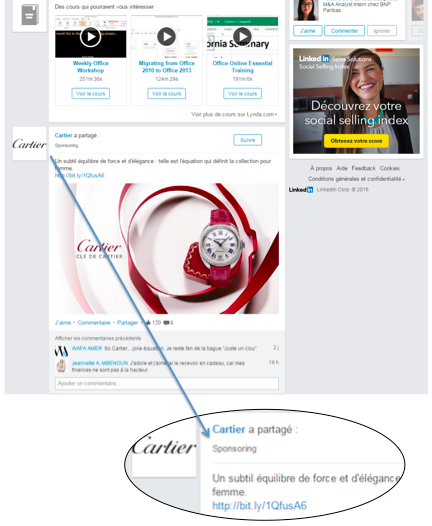 Charting the Cartier ad using the IAB framework clearly illustrates how the two ads differ in terms of function, integration and measurement. 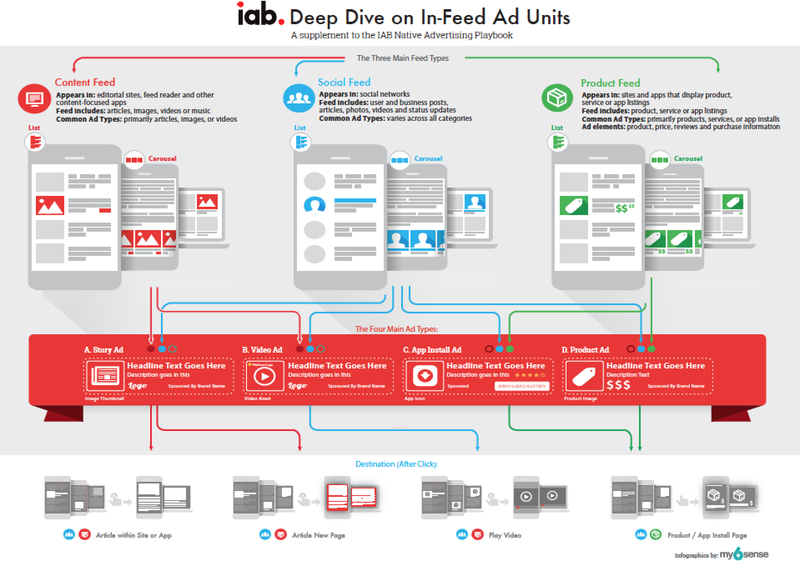 Defining in-feed can get tricky, and in the summer of 2015 the IAB released the report “Deep Dive on In-Feed Ad Units” to further clarify in-feed by separating it into three feed types (content, social and product). The Deep Dive supplement also distinguished in-feed ads by type (story ad, video ad, app install ad and product ad) and link destination (within site / app, new page, play video, or app install page). The goal was to give publishers and advertisers an improved common framework to which to refer. Definitions are important, but the IAB wants publishers and advertisers to know that transparency is essential, regardless of the type of native ad. However, even though the IAB has recently publicly questioned some of the U.S. Federal Trade Commission’s disclosure guidelines for native advertising, they continue to stress adherence to the core principle that consumers need to be able to differentiate native advertisements from pure editorial content displayed in-feed. Their study on in-feed disclosure practices shows that publishers and advertisers are on the right track, with 96% of sites using a Primary Disclosure Statement. And the IAB is right to do so. The landscape of native advertising is growing fast, so continuous reminders of definitions, principles and guidelines are necessary to ensure that publishers, advertisers, consumers and the law are all on the same page. This is particularly important when we remember that even though many native ads have been defined and characterized, not all have. Some don’t fit into any of the Core Six types created by the IAB and are dubbed “Custom” or, ironically, “Can’t be contained”. Nonetheless, the IAB is doing all it can to define the standards without stifling creativity, keeping in mind that the end goal is the overall success of the online ad tech industry.